Part of the Art Impressions Graduation 2013 collection. "This is Huge", and "You did it!" Two elephants "hug" your card closed with our new Twist Ties line! Includes clear stamps and dies. "Thatnks a ton you're unforgettable!" 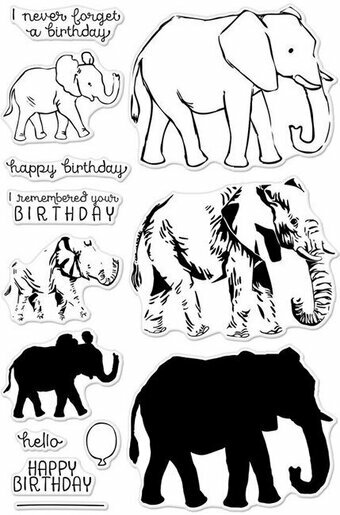 These adorable safari animals are the perfect choice for a birthday, a new baby, or a simple hello or word of encouragement. Their charming features make them a joy to color and you'll love accenting your scenes with the retro-inspired leaves and squares. This 18 piece set includes: Lion 1 3/8" x 1 7/8", Giraffe 1 1/2" x 2 7/8", Elephant 1 3/4" x 1 3/8", Hippopotamus 1 3/4" x 1 1/8", Bird 7/16" x 7/16", Leaves (2) 1/4" x 1/2", 1/4" x 3/8", Accent squares (2) 5/8" x 5/8", 1/2" x 1/2", I'm Not Lion, You're Really Awesome 3 1/2" x 1/4", You Bet Giraffe I'm Proud of You 3 5/16" x 1/4", Wishing You a Ton of Fun 2 1/2" x 1/4", I Have Big Love for You 2 1/4" x 1/4", Huge Birthday Wishes 2 1/8" x 1/4", Remember, I've Always Got Your Back 3 3/4" x 1/4", Don't Forget, I'm Always Here for You 3 3/4" x 1/4", You're Worth Roaring About 2 7/8" x 1/4", I Love You a Ton 1 5/8" x 1/4"
Step right up to the greatest showin paper crafting! This is the cutest big top around with the most talented animals you'll find this side of a children's movie. From a seal and bear with stupendous balance to a lion and elephant ready to sit pretty atop the two included stands, you'll adore playing ringmaster to this amazing crew. This 14 piece set includes: Lion 1 1/8" x 1 1/4", Seal 1 1/8" x 1 7/8", Bear 1 1/4" x 2 1/4", Elephant 1 7/8" x 1 7/8", Circus tent 2" x 1 5/8", Stands (2) 1" x 1", 1" x 3/4", You're the Ringmaster of My Heart 3 3/8" x 3/16", You Are Who You're Meant to Be 3 1/8" x 3/16", I'm Wheely Glad We're Friends 2 7/8" x 3/16", I Hope Your Birthday Is the Best Under the Big Top 2 1/2" x 3/8", Today, You're in the Spotlight 2 3/4" x 3/16", Have a Roaring Good Time 2 1/2" x 3/16", I'm Your Biggest Fan 2" x 3/16". This mini set of clear stamps may be small, but it has a ton of style! Tell your loved one how much you care with two cute elephants, a heart, exclamation point, and a "love you tons" sentiment. 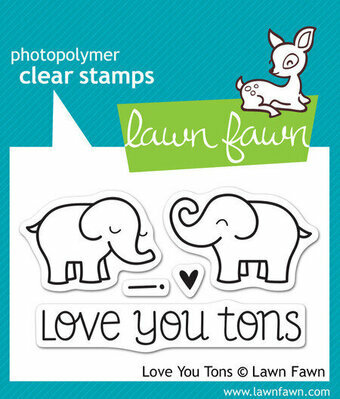 This stamp set coordinates perfectly with Love You Tons Lawn Cuts custom craft dies. Approximate stamp sizes: [love you tons] 2 3/8"W x 3/8"H, [left facing elephant] 1 5/16"W x 7/8"H, [right facing elephant] 1 3/16"W x 7/8"H, [heart] 3/16"W x 3/16"H. Made with care in the USA! Feeling fancy? Coolhave we got the perfect set for you! Celebrate in style with our safari animals and their fabulous accessories. A balloon-bearing bear in a top hat? Definitely. A slithering snake accentuating his never-ending neck with a bow tie? Absolutely! How about a super-sized elephant with a dainty bow precariously perched upon her pachyderm dome? Perfect. This study in contrasts will elevate party season in the most delightful way. This 17 piece set includes: bear 1 5/8" x 2 1/8", turtle 1 1/4" x 3/4", rhinoceros 2" x 1 3/8", elephant 2 1/8" x 1 3/4", snake 5/8" x 1", alligator 2" x 3/4", zebra 1 1/2" x 1 3/4", top hat 1/2" x 1/2", large bow tie 5/16" x 1/8", small bow tie 3/16" x 1/16", Put on Your Party Hat 2 1/2" x 3/16", Bring on the Balloons 2 1/2" x 3/16", You're a Party Animal 2 1/2" x 3/16", Let's Celebrate You 2 1/4" x 3/16", You're So Fancy 1 7/8" x 3/16", It's Always a Party When You're Around 2 1/2" x 3/8", You Make Me Feel Like Celebrating 4 1/8" x 3/16". Clear stamp sets include the name of the set on the sticker for easy identification. Our clear stamps and Die-namics are made in the USA. Mama Elephant clear stamps and dies featuring arrows, "Favorite", "Love This", "Today", "Fun Times", and more! Perfect for gift cards! Simply stamp, color, cut, and insert. Elephant "baby", bow, "For your little princess" and "For your little guy" stamps. Instructions included. Set of 3. This 3" x 4" stamp set is simply adorable. The classic images included in this stamp set will never go out of style! This set coordinates with our D-15-09 Ellie Elle-ments die set. Illustrated by Heather Campbell. Elephant measures : 1 5/8" x 1 7/8"; heart balloon measures : 1 1/8" x 2"; "celebrate" measures: 3/4" x 1/4". Our Clear Stamps and Steel Dies are proudly made in the USA. Mama Elephant clear stamps and dies featuring cute dogs, "Yappy Birthday", and "Missing you is real ruff".